Yesterday, Google launched its SearchWiki tools, which allows registered users to promote or remove entries from a Google search to further personalize results. This will allow users to customize and tailor the results to what they’re interested in, but it’s worthwhile to note that Google has probably done something similar with their personalized search histories, already offered to registered users. A few things to note: Firstly, while the act of promoting or removing a search result seems very akin to Digg, the result is not the same. 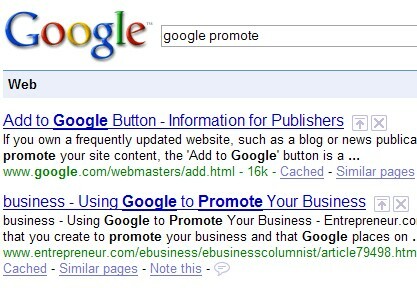 The changes you make only affect your own search results, and Google is very clear on this. However, it would be madness to believe that Google would not use the data gathered from this social experiment to further improve their algorithms. You also have the option of adding your own results to further personalize your searches and there is an option for seeing what others have recommended/promoted or removed, providing for an interesting social experiment. Secondly, as this WSJ blog notes, this ability may annoy people who have used SEO tactics to improve their site’s placement in Google’s search rankings. However, I find this complaint misses the point: Search is supposed to simplify people’s lives, and if they’ve promoted or removed a link it was because they found something to be more useful or irrelevant. This isn’t yet a “wisdom of the crowds” approach to search results, but its undoubtedly a step forward towards a hybrid approach that takes in more human input to determine the quality of results and their placement. One can only hope it will improve with time! This new feature from google called searchwiki is sure causing a stir among techies and regular surfers. Some people hate it some people love it. It is basicly a digg style vote/comment system for google search results. Check out what it looks like (if its not working in your region yet) at http://thesearchwiki.com to see some screen shots and movie about how it works.